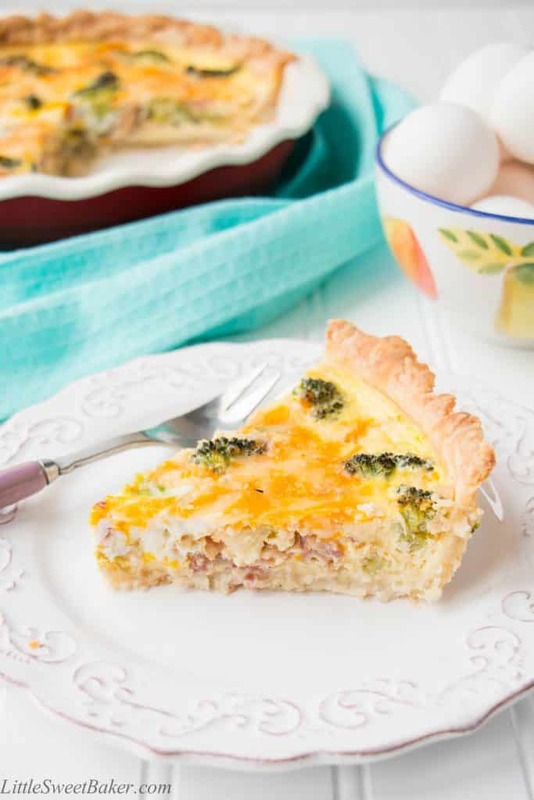 This easy homemade quiche is made with a simple flaky pie crust and filled with a velvety egg custard, smoky bacon, broccoli florets, sweet onions, and creamy cheddar cheese. A delicious quiche is sure to please no matter what the occasion. 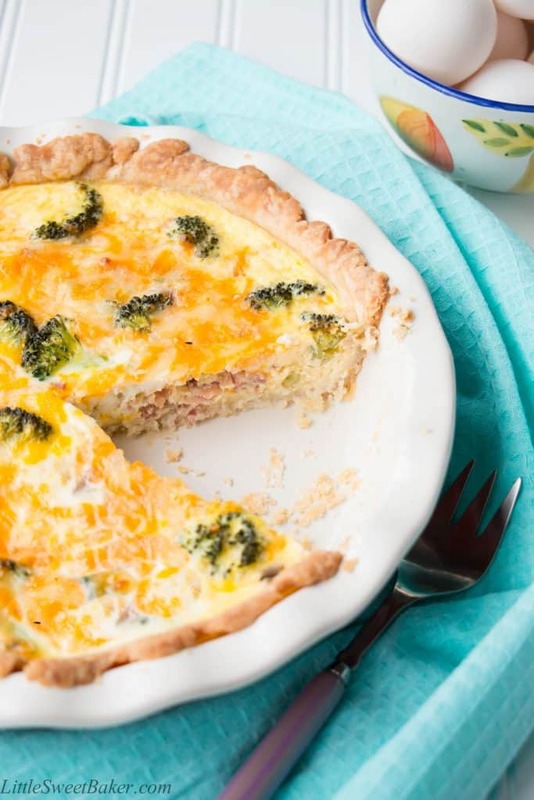 See how easy it is to make a simple and tasty quiche, and how to create your own variations. 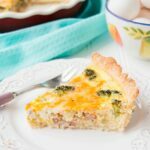 Quiche is a savory pie made with a milk and egg custard, and filled with all sorts of cheese, vegetables and meats. 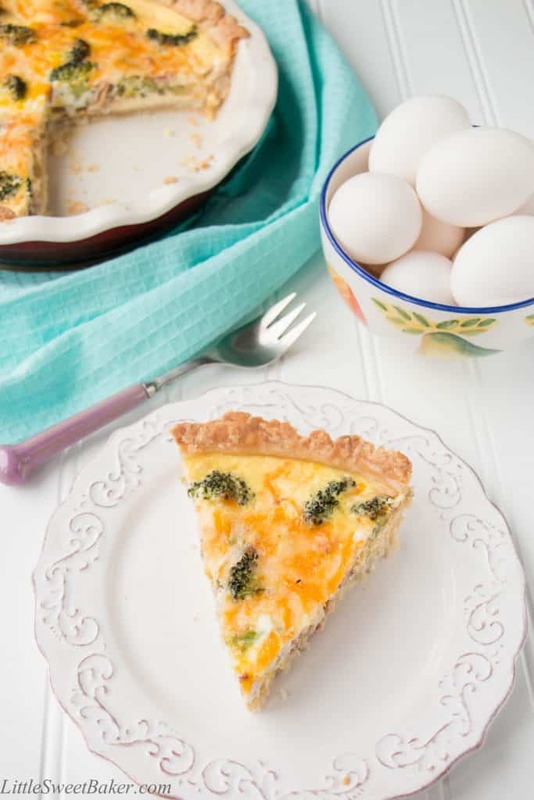 What I love about quiche is that you can enjoy it for breakfast, lunch or dinner. 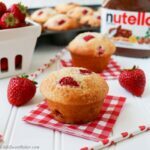 It can be a simple weekday meal or special weekend treat. It can be healthy or decadent. You can pretty much put anything you want in it to suit your taste, and it’s a great way to use leftovers. Crust: Pretty much anything goes here. Any pie crust recipe will work. I like to use my Flaky Pie Crust recipe because it’s only 4 ingredients, and it comes together in minutes because there is no chilling required. I have seen hash brown crust, sweet potato crust, and quinoa crust. You can even go crustless. It’s totally up to you. Custard: This is what holds everything together and gives the main texture of the dish. The custard is made up of simply milk and eggs. There are some options on the desired texture of the custard that depend on the ratio of eggs to milk. For a firm custard it’s 1 egg to 1/4 cup of milk. For a medium texture it’s 1 egg to 1/3 cup of milk and for a soft French style texture it’s 1 egg to 1/2 cup milk. With those ratios, you can decide on how much milk and eggs you need for the size of your baking pan and desired texture. For most 9-inch round baking pans start with 1 cup milk and however many eggs, and add more if needed. Cheese: Most recipes call for 1 cup of shredded, grated or crumbled cheese. However, there are no hard-and-fast rules here. My only advice is to adjust accordingly depending on how rich and cheesy you want it to be, and consider the type of cheese you are using. For example, if you are using a strong cheese, maybe cut it back a little so it doesn’t overpower the dish. Add-ins: 2 cups of whatever cooked meats and veggies you like or have on hand. Make sure everything is cooked through and dry. I generally go with 1 to 1&1/2 cups of veggies and 1/2 to 1 cup of meat, depending on the combination. Once you’ve decided on the components, you just put all your add-ins into your pie crust, sprinkle the cheese on top, pour the custard over, and bake. It’s that easy. Roll the dough out in between 2 sheets of wax paper to about 11 inches in diameter. Remove the top sheet of wax paper. Use the bottom sheet to lift and place the crust onto your 9-inch baking pan. Add in the broccoli, bacon and onions. Sprinkle in the cheese, salt and pepper. Whisk the milk and eggs together and pour over the top. Bake for 40-50 minutes or until a thin knife inserted near the center comes out clean. Let stand for 15 minutes before serving. 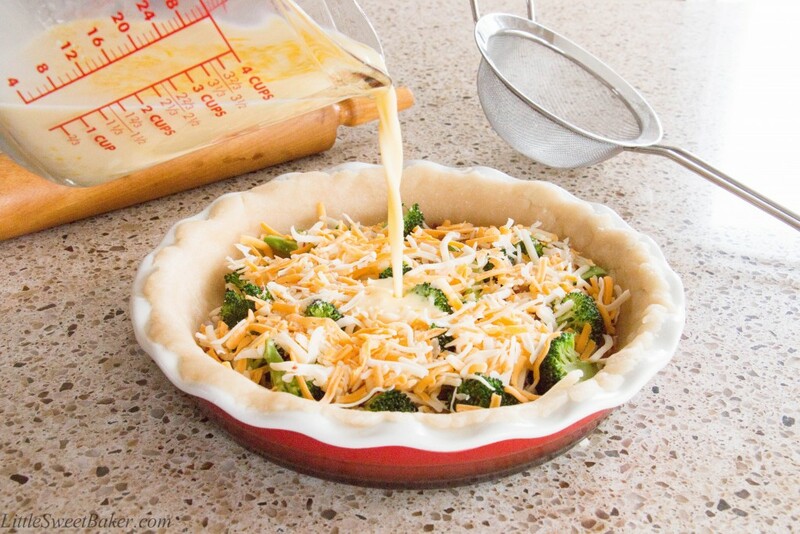 Click here for a complete step-by-step photo instructions on how to prepare the pie crust. I will also be sharing this recipe at Fiesta Friday #111.